Dr Ashraf Kitmitto is a Reader in the Institute of Cardiovascular Sciences, University of Manchester. After completing her PhD in Biochemistry from Imperial College Ashraf spent approximately five years in industry before re-entering academia. 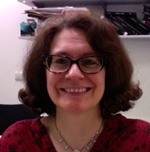 She established her own group through the award of two consecutive British Heart Foundation Basic Science Lectureships, during which time she worked on structural studies of proteins mediating excitation-contraction coupling, leading to the determination of the first 3D structure for the L-type voltage-gated calcium channel. The research focus of the Kitmitto Group has developed to also encompass the morphological changes that occur to the cellular structure of the heart as heart failure develops using state-of-the ?art 3D electron microscopy imaging methods. The group specializes in electron microscopy techniques that span single proteins/macromolecular signaling complexes (single particle analysis EM), cellular microdomains e.g. dyadic cleft (electron tomography) through to whole cardiac myocyte imaging (serial block face scanning electron microscopy). A particular focus is the structure of the sarcoplasmic reticulum (SR) and how remodelling in cardiovascular disease impacts upon calcium-cycling within the microdomains formed between SR and the t-tubular network, sarcolemma and mitochondria. In order to correlate structure to function there is also a strong emphasis upon interrogating morphological data within the context of the molecular basis of heart disease. 3D imaging is therefore complemented by studies of cardiac proteins involved in regulating contractile function and importantly, how these mechanisms are perturbed in cardiovascular disease.